How does your solicitor negotiate your personal injury claim with the insurers? You are here: Home / Valuation of claims / How does your solicitor negotiate your personal injury claim with the insurers? We got some questions from a client about the general issues which arise when you’re negotiating a personal injury claim with an insurance company. An article seemed like a good way to bring these answers to a wider audience. (Note that we have also based a podcast on these same questions – go here if you would prefer to listen rather than read). We’re talking about the stage in a claim where liability has been admitted and it’s about maximising the settlement figure with the insurers. The hope is that it will be possible to agree a figure by negotiation but, in the background, there’s always the possibility that you might need to raise a court action to achieve a reasonable level of compensation. What tactics and strategies apply here? Do we have to show our hand first rather than let the insurer make an initial offer? This is generally the way it is done. 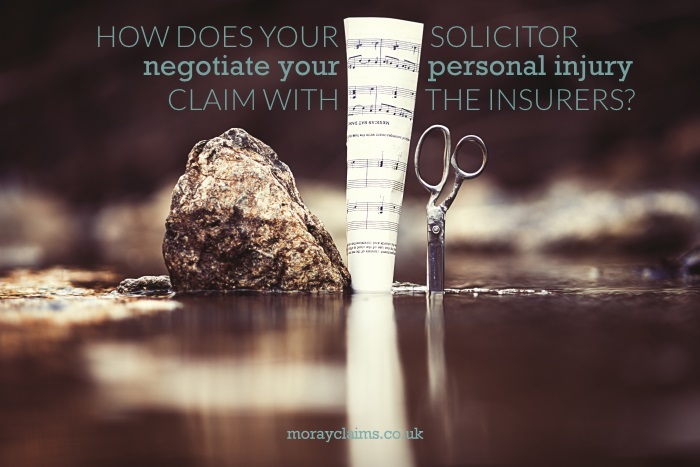 Claims in Scotland are most often negotiated according to a pre-action protocol – basically, an agreement between solicitors and insurers on the intimation and handling of personal injury claims. It used to be a voluntary scheme but, for accidents after 28 November 2016, a compulsory pre-action protocol applies. In terms of the protocol is envisaged that, once liability is admitted, the claimant’s solicitor will provide a full valuation of the claim for the insurer. In theory, it would be possible for your solicitor to send the medico-legal report obtained in your case to the insurers and see if they came up with an offer. The problem is that that would, of course, only generate an offer in relation to solatium (the pain and suffering of your injuries). Your solicitor would then still have to go back to them to explain all the other elements of the claim, including things like wage loss, services and so on. Will the insurers argue for a reduction in the amount claimed? The answer to this is “almost certainly”. While there may be good reasons for it in particular circumstances, your solicitor gets an uneasy feeling if the insurer accepts the solicitor’s valuation in full. Should the valuation be “slightly higher” to allow for the likelihood that the insurer will seek to reduce the value of the claim? Your solicitor can only do this to a certain extent. Some elements of the claim are more “concrete” than others. For example, many claims for loss of earnings are matters of arithmetic and not capable of producing disagreement to any great extent. However, even wage loss can be controversial if there is disagreement about the effect the accident injuries had on the length of time you were reasonably off work following your injury. With other parts of the claim – such as solatium – there is “always” scope for disagreement. The aim is to end up with a valuation which is somewhere between what might be described as the lowest reasonable value and the highest reasonable value for solatium. With some injuries – e.g. soft tissue injuries and neck/back injuries – there tends to be more scope for disagreement than with more clearly-defined injuries, such as a fracture. It also depends on how clear the standard guidelines (the Judicial College Guidelines) are for the particular injury. Some entries in the guidelines are quite vague and general; others are very specific (e.g. there is a value provided for a “straightforward Colles fracture”, which is a particular type of broken wrist, affecting the radius bone). It is always likely to be more complicated, the more injuries the person has (e.g. multiple fractures and soft tissue injuries). There is a limit to what your solicitor can do to beef up the value of the claim. Beyond a certain level of increase, the risk is that your solicitor will lose all credibility with the insurers and that will damage their ability to negotiate with the insurers and obtain a fair settlement. Your solicitor will discuss with you any offers received from the insurers, in detail. It is not possible to predict what response your solicitor’s valuation will get from the insurers. We find that it is not so much about differences in the reasonableness of particular insurance companies; it tends to be more a matter of individual claims handlers, in our experience. Having said that, some insurers certainly seem to be more pragmatic and sensible to deal with than others. Where the insurer comes back to your solicitor with a counter offer (i.e. a lower, compromise offer) which is simply a figure, without any further explanation, unless that is an obviously good offer in the circumstances, your solicitor will usually ask them to explain the basis of their valuation, with reference to authority/vouching. It is important always to be open to being persuaded that your side’s valuation is too high. Provided the insurer comes up with a good argument, that is. If they refuse to explain themselves – and some insurers take that line – ultimately, you have to make a decision with your solicitor whether to accept or litigate (if we are confident we can beat their offer). What are some the variables that affect negotiation of a personal injury claim? What might be an example of how a negotiation proceeds? As no two cases are ever alike, it’s probably dangerous to give an example of how a negotiation might proceed. We have had to anonymise the information but an example follows, for what it’s worth. Valuation for claimant at £7,870. Insurers’ offer of £3,980 (no explanation of breakdown). Reply to insurers asking for breakdown before solicitor takes instructions on the offer (so it can be explained to the client). Increased offer from insurers of £5,680 (i.e. without any counter-offer having been put to them first – very unusual, in our experience) including an explanation of how that offer has been formulated. Counter-offer on behalf of client at £6,480 on basis that the insurers’ offer for solatium proceeds on a misreading – or at least misinterpretation – of the medical evidence (their offer for solatium is too low). In this article, we looked at some more specific aspects of the question: How does your solicitor negotiate your personal injury claim with the insurers? We hope you found the information helpful. If you have any related questions, please get in touch with us. The same applies if you want to enquire about any aspects of our personal injury claims services. All initial contact is free of charge and without obligation. Call us on 01343 544077 or send us a Free Online Enquiry.